Originally posted at Skeptical Science on March 24th, 2015. 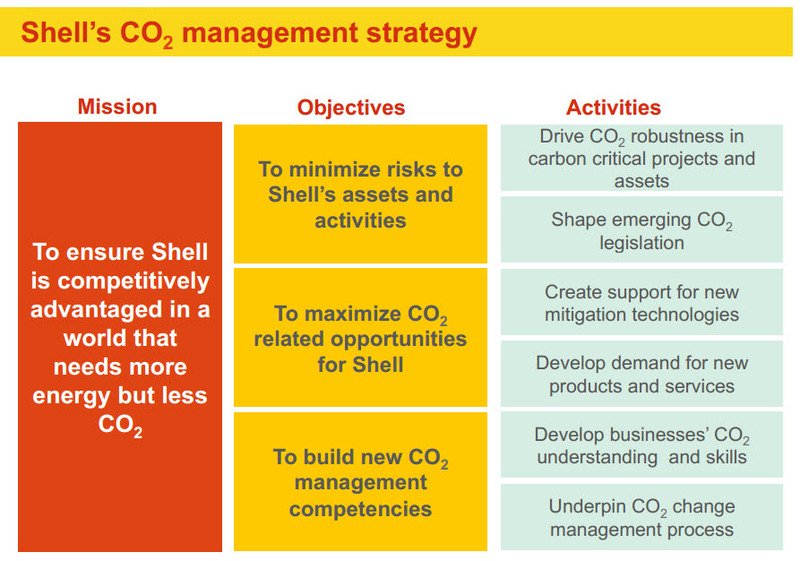 Shell evaluates all of its projects using a shadow carbon tax of $40 per tonne of carbon dioxide. That’s great. But why is the company still exploring in the Arctic and busy exploiting the Alberta oil sands? Shell employs engineer David Hone as their full-time Climate Change Advisor. Hone has written a small ebook Putting the Genie Back: 2°C Will Be Harder Than We Think, priced at just 99¢ and he writes a climate change blog that should be part of every climate-policy geek’s balanced diet. Shell also has a position they call Vice President CO2, currently occupied by Angus Gillespie. Here’s Gillespie talking recently at Stanford on the company’s internal shadow carbon pricing strategy (hat-tip to John Mashey). It’s worth watching if only for Gillespie’s vivid example of the limitations of looking at averages. The slides can be downloaded here. Gillespie describes why and how Shell incorporates an internal carbon price of $40 per tonne of CO2 as part of its routine economic analysis of new projects. Upon hearing about this process, a friend asked: “If they are really doing that, how come they are still planning to explore for oil in the Arctic?” That’s a good question and in trying to answer it, we can better understand how much a motivated big oil company can do to reduce emissions by themselves and, importantly, how little they can be expected to do. Big oil companies conduct thorough economic and risk analyses on all their new projects. These are done not just to make sure that projects exceed internal profitability measures, but also to rank the projects from best to worst and to make sure that the company has a portfolio with balanced risk profiles, with the eggs kept in different baskets. With the recent halving of oil prices, every company will now be going through these portfolios, axing the projects that no longer make sense at $50/barrel. As part of the risk-profiling exercise, the threats posed by changing regulations have always loomed large. These would include changes to the royalty and taxation structure and also any potential alterations of environmental and safety regulations. What Shell is doing is different. They are not just looking at the what-ifs to identify threats, but instead telling all of their engineers and analysts that there is a flat $40 per tonne charge on all emissions that applies now, and in the future, on all projects, everywhere. Basically, by quantifying the emissions impact it moves emissions “from the conversation to the spreadsheet” as Gillespie puts it. It also focusses minds at the operational level: without measuring emissions they would not be able to start to manage them. The company does not, of course, go as far as to make voluntary donations of the imputed carbon tax to governments, so the shadow tax does not move from the spreadsheet to the balance sheet. However, it does influence the company’s project choices, as well as their operations-level practices, as if the tax were real. On project choices, for example, imagine that the company were comparing two rival natural gas projects in different basins. Let’s assume that the projects were equal in value but that in one case the gas produced from the subsurface naturally contains 10% CO2. It’s normal practice to strip out the CO2 to make the methane marketable and then for the CO2 to be vented directly to the atmosphere, typically with no payment of any carbon tax penalty. (This is what happens, for example, in British Columbia’s Horn River Basin, where the vented CO2 is not susceptible to the provincial carbon tax.) 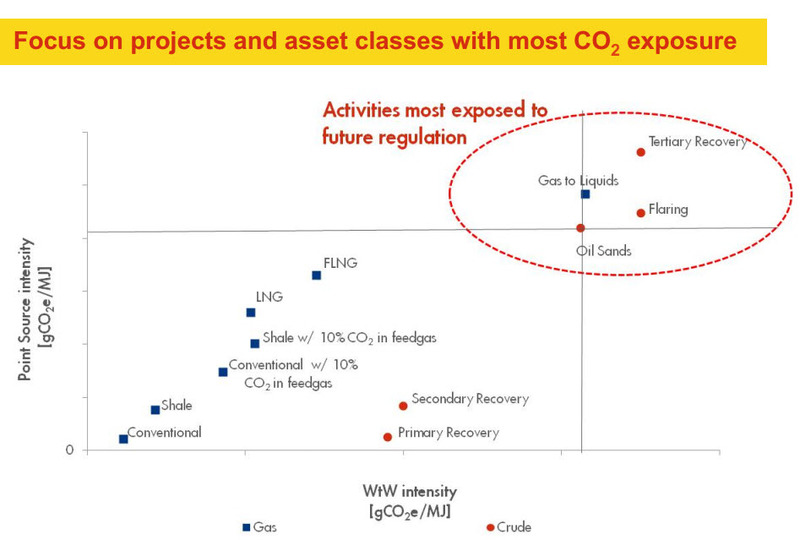 Shell would choose the project in the basin with the CO2-free gas, other things being equal. Although this would provide no immediate financial benefit, it would reduce the company’s emissions and would lower its future liabilities in the event that the vented CO2 becomes taxable. At the operations level, engineers would be motivated to reduce any emissions at a cost saving of under $40/tonne by choosing, let’s say, more efficient but more expensive vehicles. This might increase Shell’s costs a little, but reduce their emissions. The forced exercise of looking for emissions savings might also turn up a few no-regrets opportunities where both costs and emissions could be reduced. This kind of internal carbon pricing could be done by any company—or individual, for that matter— and it’s not the exclusive domain of fossil-fuel producers. According to a World Bank report, Shell emits about 80 million tonnes of CO2 annually from its operations. At a carbon price of $40/tonne, that amounts to an imputed cost of $3.2 billion per year, which is big bucks, even for big oil. However, that’s not even the half of it, the emissions from the end use of Shell’s products (i.e., by consumers) amount to 600 million tonnes of CO2. Those emissions would be taxed by a real price on emissions, but they are not considered in Shell’s internal calculations. The most important action of a real carbon tax would take place outside the chain link fences surrounding Shell’s wells and plants. The vertical axis is the emissions intensity from production operations and is the factor important in Shell’s shadow carbon price. The horizontal axis is the well-to-wheels emissions intensity and is the factor that would determine the extra cost of a real carbon tax. Coal would be plotted off of the graph to the right, while renewable and nuclear energy would be far off the graph to the left. The numbers on the axes are not labelled, but my guess is that the y-axis runs from 0 to 30 and the x-axis from 50 to 90 gCO2e/MJ. Comparing asset classes within a particular fuel type (i.e., gas or oil), the increasing emissions arising from more intensive production methods are associated with the vertical axis, whereas the well-to-wheels emissions (which include end-use combustion) depend also on the chemical make up of gas versus oil and the two fuel types are therefore differentiated along the horizontal axis. The projects most exposed to real-world carbon pricing will be the ones in the top right-hand corner. The shadow carbon price therefore sends signals that matter within a fuel type, but does little to forecast the effects of real world carbon price, which will hit oil more than it will gas and, of course, will clobber coal most strongly of all. The degree of exposure of a project to future regulation depends not just on the emissions, but also its profitability. Projects that are marginally economic today because of high costs, for example Arctic oil or ultra-deep water oil, would risk becoming unprofitable with the addition of carbon pricing. Arctic oil, for example, may not be particularly emissions-intensive—it would likely plot somewhere a little above and to the right of “Secondary Recovery” in the graph above—but the expense of working in a remote and hostile environment would make it vulnerable to any additional burdens. Expensive and carbon-intensive asset classes (I’m looking at you, oil sands) will be the most vulnerable of all. A real-world global carbon tax will produce big changes in demand too. That’s the point. It will encourage people to reduce their fuel usage and switch to untaxed, emissions-free sources of energy. The prices that fossil-fuel producers will receive will drop, while the price consumers pay will go up. Sooner or later, producers will be forced to leave their assets in the ground. Sooner would be better. A recent paper by McGlade and Ekins (paywalled, but there’s a good Carbon Brief summary available and a critical take from Andrew Leach) looked at the fate of the world’s fossil fuel resources under climate policies that kept warming to two degrees. We show that development of resources in the Arctic and any increase in unconventional oil production are incommensurate with efforts to limit average global warming to 2°C. Our results show that policy makers’ instincts to exploit rapidly and completely their territorial fossil fuels are, in aggregate, inconsistent with their commitments to this temperature limit. Implementation of this policy commitment would also render unnecessary continued substantial expenditure on fossil fuel exploration, because any new discoveries could not lead to increased aggregate production. In contrast, Shell’s two New Lens Scenarios, named, for obscure reasons, Oceans and Mountains, foresee a future in which fossil-fuel companies continue to play a major role, both by producing fuels and reburying the carbon through carbon capture and storage. At these links, you can view a short video and the pdf of the report. Below is a graph from the presentation. The “Oceans” scenario is roughly equivalent to the IPCC’s RCP4.5. The illustrative 2°C pathway approximates to RCP2.6 and the “Mountains” pathway somewhere between the two. Neither of Shell’s scenarios comes close to the RCP8.5 pathway, sometimes dubbed “business-as-usual”, but both would make exceeding the 2°C target more likely than not. The cumulative emissions from now until the end of the century would be about 50-100% more than for the “safe” pathway. Basically, Shell neither believes that achieving the 2°C target is achievable nor that the future of fossil fuel extraction is realistically described by the modelling of McGlade and Ekins. Large international oil companies like Shell have limited options for the kind of big, new oil projects that are worthwhile for them to pursue. Much of the world’s untapped conventional oil is now controlled by state oil companies, whereas the unconventional plays, such as shale oil in the US, are dominated by smaller, more nimble competitors. The remaining exceptions are the oil sands in Alberta and exploration projects in the Arctic and deepwater. These provide a good fit for the oil majors’ project management and technology skills. Because of their pessimism that the world will be unable to avoid dangerous climate change, Shell sees growth potential for their core business over the coming several decades, despite their internal carbon-pricing exercises. It wouldn’t be fair to scorn Shell for their carbon-pricing efforts. If every company instituted a shadow emissions tax and acted on the cheaper mitigation opportunities, as Shell does, the world would be a better place. And, by recognizing the reality of the science and by calling on governments to apply an effective carbon price, they are not obstructing the way ahead. You cannot solve a problem without naming it. The absence of official recognition of the role of fossil fuel production in causing climate change – blitheringly obvious as it is – permits governments to pursue directly contradictory policies. While almost all governments claim to support the aim of preventing more than 2C of global warming, they also seek to “maximise economic recovery” of their fossil fuel reserves. You [van Buerden] have an undeniable interest in the choices society makes about climate change. But you have been sophisticated in pursuit of that interest, as you perceive it. From the start, nobody has been less aloof, more assertive, nor more influential than the oil and gas industry. The full text of the speech is here: read it, it’s quite the rant. 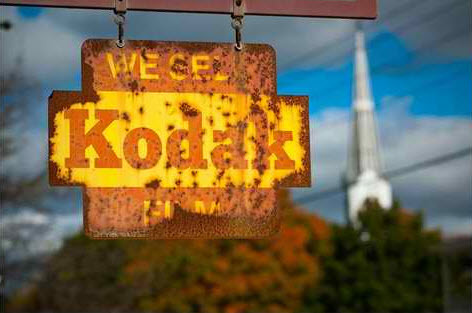 Not long ago, Kodak was a company with 145,000 employees and a reputation for top-notch technology. It also made huge profits. Now, thanks to digital cameras and a failure to diversify its product line, the company is just a shell (sorry) of its former self. Of course, the transition away from fossil fuels will not happen as quickly as the change to digital photography did. Retiring and replacing the infrastructure of fossil fuels will take decades rather than years. But it’s little use expecting the oil companies to take the lead in this transition, after all, it will render their currently valuable physical and organizational assets obsolete. Even as the more enlightened oil companies accept the science ofclimate change, the brutal mathematics of emissions reduction leads to the conclusion that most fossil fuel reserves have to be left in the ground. For an oil company, this naturallyleads to what sociologist Kari Norgaard has referred to as implicatory denial. Shell has been a leading energy corporation since the late nineteenth century, but its core business model, built around fossil fuels, cannot and will not last forever. If we are to keep global warming below 2°C then, by 2050, old filling-station signs bearing the familiar red-and-yellow pecten logo will have become nostalgic icons, the way that Kodak’s are today. This entry was posted in Uncategorized and tagged Arctic, Carbon Tax, Fugitive Emissions, Mitigation, Oil Sands, Shell. Bookmark the permalink. 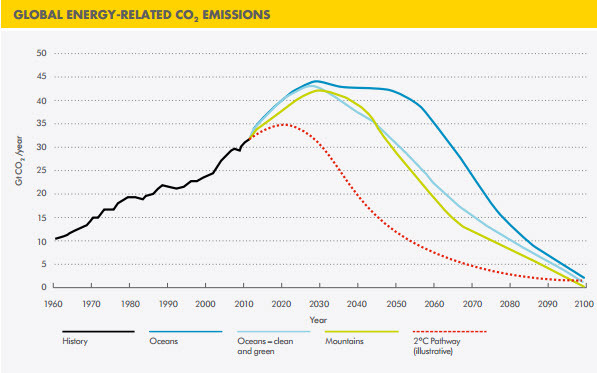 ← Have we turned the corner on emissions?